Sometimes we even find ourselves fearing that Christmas would not come at all. Would the Grinch be victorious in his evil plot? Even though we know the ending to the story of the Grinch, the question is still real. Could the magic of Christmas really be stolen from an unsuspecting town of Whoville? Will the wonder of Christmas be spoiled for unsuspecting children of Abbotsford? While we wish we could guarantee that every child in Abbotsford had the true Christmas experience, we have to be honest, we can not make that guarantee. But together, we try pretty dang hard. We have been blown away by all the support that has come walking through our front doors in the form of food drives, toy drives, financial collections and the stories of sacrifice. Here’s one story of a family that budgeted their sacrifice all year to be able to ensure another family could experience the hope and joy of Christmas. “For the past 24 years my husband and I have been doing hampers at Christmas for needy families. In the past we have been in a position where we had to rely on hampers at Christmas time. The donated food and gifts were the only gifts and Christmas dinner our children received. Without that help, Christmas and the weeks following would have been even bleaker. We decided we wanted to be in a position to give back. To give someone else the same relief and hope we received. I am not putting this out there for ‘that-a-boys’ or kudos, I want you to see what you can do if you spread your donation out over a year. 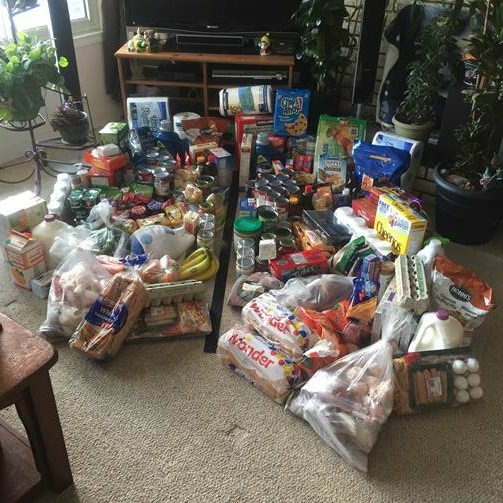 That you too can help out a needy family in December, without breaking the budget. Over the past couple of years, my husband and I have struggled to supply the hampers, yet we have always found a way to get them completed–always remembering that we committed to helping these families out. This year we decided to do 2 separate hampers. One for a senior and one for a single mom. Knowing that we could not possibly do two hampers at the end of November, we committed to putting money aside throughout the year. This is how we did it: First we committed to spending $20 a payday for food off my husbands pay cheques. We purchased food every grocery buy and set it aside in boxes. We watched all our expiry dates, took advantage of case lots sales, bought in bulk and made lists of all we had accumulated. In October we applied to the Abbotsford Christmas Bureau for our families. Once we had their food preferences for certain non perishables, dairy, fresh produce and meats, we added those items to the hampers. We also set aside $20 a payday off my pay cheques to be used for gifts. Tasha’s story is one of many stories of people who have reached out to our community over Christmas with the help of the Abbotsford Food Bank and Christmas Bureau. Together we worked hard to provide a meaningful Christmas full of hope for those who need it most. The fears that haunted the Christmas planning are once again squashed. In the end, both the donor and the recipient can share in the joy of a merry Christmas.